Longtime collaborator, fellow artist, and friend, Lynzee Lynx, and I are excited to team up for this special retreat offering. As creative guides, we often hear people express a deep desire to find their unique style of artistic expression, and we understand. We know making art that is unmistakably your own is both satisfying and integral, but we also recognize that finding your own style takes attention, patience, resourcefulness, and time. In response to this hot topic and our passion for authentic creating, we’ve designed a powerful and playful curriculum with the intention of supporting you to discover and hone your own unique voice and style of painting. Using the vehicles of mixed-media art, movement, meditation, and writing, we’ll explore personal experience, individual preference, story-telling, passion, intuition, and body wisdom. What we uncover through these inquiries will become fuel for our unique creative expression. In addition to facilitated class time, you will have ample Open Studio hours available each day to immerse yourself in your art-making process. Table and wall space will be available. By the end of the retreat, you’ll leave with a fresh perspective, along with a rich, visual resource guide or “archive” of inspiration to reference and build upon for years to come. You’ll also have the chance to work on several large paintings on watercolor paper or canvas throughout the workshop to integrate what you’re learning along the way. 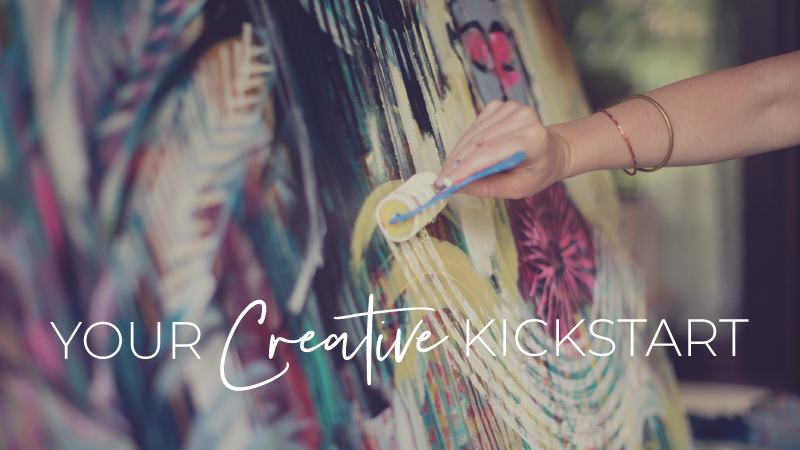 We believe the wealth of personal imagery, symbols, color palettes, stories, and techniques you’ll discover through this process will serve as invaluable support for your future art-making adventures, as well as your life beyond the canvas. Prerequisite: Completion of the Bloom True E-Course, a Bloom True Retreat, or extensive experience with the Brave Intuitive Painting process. Why the prerequisite? This retreat does not focus on or teach the basics of intuitive painting. Instead, it encourages you to find your authentic voice by using the Brave Intuitive Painting process as a jumping off point. If you’re ready to infuse more meaning, personal story, and depth into your work, while truly setting yourself apart from the rest, this workshop is for you. Flora Bowley’s Portland, OR studio. Exact address will be sent upon registration. Our retreat will begin Wednesday evening with an Opening Circle from 6:30 p.m. – 8 p.m. Retreat hours will take place between 10 a.m. – 5 p.m. each day with ample optional Open Studio hours offered each morning and evening for luxurious integration time. We will end midday on Sunday. We will provide an abundance of delicious, local, organic catered food throughout the retreat, including dinner on Wednesday, lunch on Thursday, a pizza party and campfire on Saturday night, and a farewell lunch on Sunday. Beautiful gourmet, seasonal platters, handcrafted tea, and fair trade coffee will be available throughout the weekend. All other meals will be on your own. There is a natural grocery store three blocks away, as well as many neighborhood restaurants. You are also welcome to bring your own lunch and relax in the studio over the break. The workshop is limited to 14 students to ensure lots of personal attention, one-on-one support, and plenty of space to explore and create. Each participant will be invited to a private Facebook group to foster connections among the group. Completion of the Bloom True E-Course, a Bloom True Retreat, or extensive experience with the Brave Intuitive Painting process. We will provide extensive mixed-media materials, as well as large watercolor paper, brushes, palettes, and rags. We will have 36″ x 36″ canvases available for purchase. You will be asked to bring the following (a more complete materials list will be emailed upon registration). Loose, comfortable clothing. We’ll be moving our bodies and getting messy!